You folks in the Asheville region are lucky. You’ve got Peanut Butter Jelly Time on your selves for the next week or so. I was lucky enough to snag one of the new 16oz cans of this year’s brew (last year it was 12oz cans) and I cherished every drop. I only allowed my wife one sip. 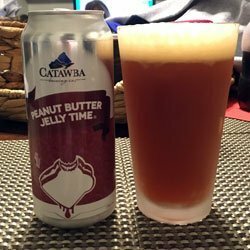 Catawba Brewing had their release party last night (Friday, March 3rd) and are releasing it to the market Monday the 6th. This year’s brew is just as good as last year’s but has a slightly different profile from what I remember last year. Maybe it was from their use of their new centrifuge or they tweaked the recipe. I was lucky to be invited to their release party last year in Asheville. It was a great experience meeting owners, Billy and Jetta Pyatt and head of brewing operations Kevin Sondey. They told me that they have tweaked the recipe over the years to improve the flavor but also to deal with using peanuts. Peanuts don’t act like hops or barley. You’ve got to deal with all that peanut oil that comes from the aging process (which lasts several weeks). Don’t know if they tweaked it or not but it’s a great brew. There is a reason it has developed a cult following. This year’s brew still has that distinctive peanut butter taste. On first sip it seems a little dry, sort of like a bitter hop feel, but without the hop flavor. But on second sip your mouth has been coated and it starts to get real smooth and you’re reminiscing about peanut butter sandwiches as a kid. The jelly flavor, assuming it’s the same as in the past –a raspberry puree, comes out more at the end. So, starts off peanutty then turns slightly sweet with the jelly. Nice drinking brew. And you can drink more than one as it’s 5.7%. The brown ale backbone gives great support. This is one cloudy brew. They might run it through the centrifuge but they didn’t take away all that peanut stuff in there. The cloudiness gives it a peanut butter look. Now if you want to buy some hurry. These won’t stay on the shelves for more than a week according to what they told me last year. 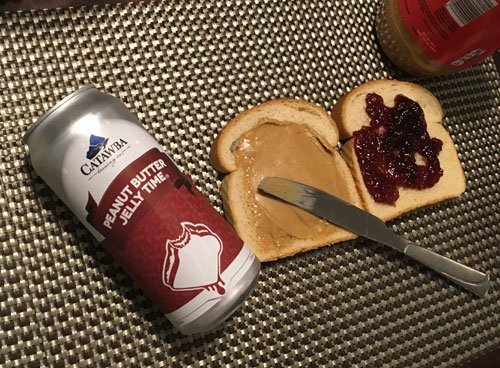 If you want to read about how this brew came about (one of their former brewers lost a child in an accident and he wanted to honor the child with one of the simple things in life they loved–a peanut butter and jelly sandwich) you can click here and read about last year’s release party. I’m tempted to hop in the car and head towards North Carolina and find some.